All standard shipping is done via USPS Priority Mail or UPS ground for all domestic orders and USPS for international orders and APO's. All orders ship within 48 hours, but most will ship within 24 if received early enough in the day. Backorders will ship as soon as they are available. Weekend and Holiday orders are shipped on Monday or the first business day after the Holiday. We ship DHL only which will not deliver to a PO Box, so you will need an actual street address for shipping. Wrong Address: If you have given a wrong address during the ordering process and your order was shipped before you could inform us, we will have to wait until your order gets back to us until we can reship. Note: we will notify you and you will be responsible for the reshipping charges which we will invoice you. Shipping Outside the US: All shipping to destinations outside of the U.S. will be shipped via USPS. Each country has different regulations regarding the import of specific nutritional supplements. Not all supplements are allowed in every country. Although we do our best to keep up with these regulations, it is impossible for us to know all of the specifics for each country. It is therefore the responsibility of the customer to know whether the product or products being ordered are allowed in their country and any specific taxes or duties that their country might charge. The customer is responsible for all customs, taxes and duty that might be imposed by their country. Shipping time can take between 5 to 14 business days. Please allow extra time for countries whose customs department inspects packages as this can slow your order. Foreign orders ship within 72 hours. All international orders are non refundable. If your order is seized by your country customs, we DO NOT take resposibility. Also we do not take responsibility for delivery's that are damaged, delayed or lost by international postal services. There are No Returns on INTL orders. We do not ship to the following countries: Austria, Afghanistan, Cuba, Germany, Finland, Iran, Iraq, North Korea, Nigeria, Pakistan, Syria, Sweden, Sudan and Ukraine. This is subject to change depending on countries product import policies. NOTE: If the item(s) have been opened, we are unable to accept them for return. If your order was damaged during shipment, please do not open the item and contact us immediately so we can advise you how to return the order to us. In order to return any product, you must send us online message to let us know why you are returning the product(s). Use the Contact Us form to send a message. When emailing us, please include your order number and a item description in your email. All returns and exchanges must be accompanied by original sales receipt or be a recorded transaction in our computer system. Any item you wish to return must be received back to our warehouse within 14 days of receipt of the product. The item must be returned at the customers expense, and must be unopened and undamaged for a credit ( less shipping & handling ) to be issued. Again please email us prior to returning any merchandise and make sure to include your order number and the item description in your email. Also when shipping it back email us your shipping tracking #. Note: After 20 days past the date of receipt of your order, no returns are accepted. Full credit for the returned item will be issued for "unopened and undamaged" merchandise within 10 business days of our receipt of the returned package. Any time after 10 days there will be andditional 15% re-stocking fee. As we are unable to re-sell products that are returned, so that we ensure that our customers receive the freshest and best possible quality in their original order. Any and all shipping costs cannot be refunded. We recommend that you pack the item carefully and insure the package, as any items lost or damaged in shipping cannot be refunded. If you elect to use USPS for your return, the package must have Delivery Confirmation, or we cannot guarantee that your item will be credited. ProSport Nutrition makes every effort to safely secure and ship all packages, but occassionally merchandise can be damaged during the shipping process. Merchandise damaged during shipping should be reported to ProSport Nutrition (prosportnutrition.net) within 48 hours of receipt. The shipping company will be contacted for visual inspection of the merchandise and packing materials. We will then issue you credit for the amount of any confirmed damaged merchandise or ship you a replacement at no charge. Note: We cannot accept returns on any heat-damaged products. You must be available to receive your order or provide special delivery instructions for the carrier to leave your delivery in a cool area, at a neighbors house, or not to deliver if no one is home. You may also have your order shipped to your workplace. If you wish to cancel an order, you will need to email us right away. We will make every attempt to stop your order. However, if your order has already been shipped, you will have to return the package (see return policy listed above). Any order that is cancelled after it leaves our facility will be considered a return, and all policies listed apply. 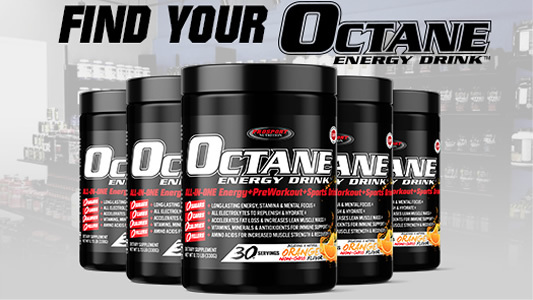 OCTANE Energy Drink™ (1/4 case - 3 Tubs) S/H Discounted. 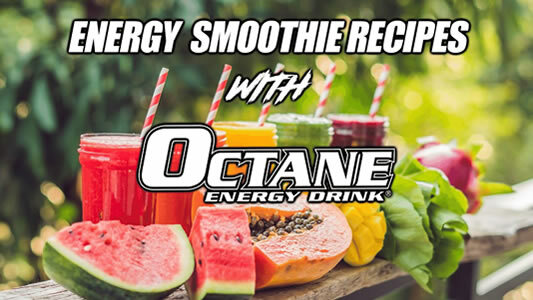 OCTANE Energy Drink™ Sample Packets. FIT SALT - Case 36 Bottles. SALE: FREE SHIPPING! FIT SALT - Case 12 Bottles. S/H Discounted.